The Batch of 2019 is ready to enter these gates and this time, it’s going to be bigger and better than EVER! “The day might be yours, but the year will be mine,” Tiger Shroff declares in the trailer of Punit Malhotra’s upcoming Student of The Year 2. The film’s trailer was released on this Friday 12 April,2019. Ananya Panday, who is the daughter of Chunky Panday, will make her debut in this film, as will actress Tara Sutaria. Student of the Year 2 is the second installment from the franchise. The first one was released back in 2012, which debuted Varun, Alia and Sidharth. The three actors have since become among the top stars in the film industry. Tiger Shroff plays a encouraging student of a very posh school, who is competing for the coveted Student of The Year trophy at an annual competition. When life, romance and rivals get in his way, Shroff gets expelled from his school. 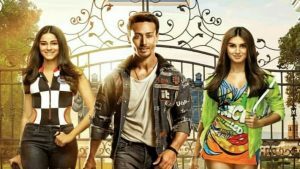 The Karan Johar-led Dharma Production’ upcoming release Student of the Year 2 is set to release in less than one month from hitting theatres and the makers have just dropped the trailer of the next generation film which stars Tiger Shroff, Tara Sutaria and Ananya Panday. While Karan Johar and the stars of the film have been teasing fans with posters and behind-the-scenes photos and videos of the film for more than a year, we finally have some official video footage from this upcoming movie. The trailer looks fabulous and energetic. ! Be it the the leading cast in the movie, Tiger, Ananya and Tara, or the production value, sets and overall ambiance – it’s all a visual treat. We already updated some news leaks in the past about the film, including the fact that Hollywood superstar Will Smith has a cameo in Student of the Year 2 and there are also rumours that Varun Dhawan, Alia Bhatt and Sidharth Malhotra might have shot for a song. While Karan Johar personally had directed the first Student of the Year movie, the sequel has been directed by Director Punit Malhotra. The director is best known for making films like I Hate Luv Stories, which starred Imran Khan and Sonam Kapoor and Gori Tere Pyaar Mein, which starred Imran Khan and Kareena Kapoor Khan. SOTY 2 is all Set to release on May 10, 2019 and Student of the Year 2 is among the most-anticipated films from the Dharma Productions’ line up. However, it’ll be Varun Dhawan and Alia Bhatt starrer Kalank, which is Dharma’s immediate next and will hit theatres on April 17, 2019. The production company will also release films like Good News with Akshay Kumar, Kareena Kapoor Khan, Brahmastra with Ranbir Kapoor and Alia Bhatt, and Saaho with Baahubali star Prabhas.